Augusta State Medical Prison is located in Grovetown Georgia, part of Richmond County. It is a medical prison, that houses adult male offenders who need either medical or mental health treatment. 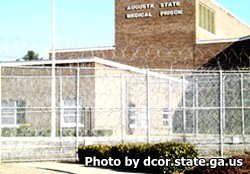 Augusta State Medical Prison also gives mental health services to female offenders. The housing unit at this facility is setup similar to an open dormitory and can currently hold 1326 inmates. Offenders who are incarcerated here can also participate in various academic, religious, and work activities. Inmates can earn their GED, take classes in adult basic education and learn to read. Bible study and worship/prayer services are offered by the chaplains office, and vocational skills include laundry and food services, barbering and custodial work. Offenders can also work in conjunction with the department of transportation, do in house custodial and landscape work, as well as warehouse and maintenance. Visiting for the general population is on Saturdays and Sundays from 9am-3pm. Inmates in protective custody have visiting on Tuesdays and Wednesdays from 9am-3pm, but are only allowed visits on one of the days each week.